Can you tell if a person has blocked you? HomeprofileCan you tell if a person has blocked you? Can you tell if a person has blocked you? Here's how to tell if someone has blocked on Facebook. Getting blocked on Facebook is not fun for anyone, however, if you also use Facebook for your small business, getting blocked can take on a whole new dimension in terms of unnerving experiences. However, with a bit of detective work, you can usually ascertain if you have been blocked. Bear in mind that just because someone is no longer visible in your list of friends does not necessarily mean you have been blocked. Search Results If someone has blocked you, rather than simply discontinued your friendship, his name will not show up in your account's search results. Try typing the person's name in the search field at the top of your Facebook home page. If you don't find that person, you may have been blocked. Try searching for the person again. If the person is not visible in a public search or from your business account, you may have been blocked. If the person is visible in a public search, but not visible in a search from your personal account, you've been blocked. Mutual Friend List Mutual friends can be a good indicator to see if you have been blocked. Navigate to a profile of someone who was a mutual friend with the person you suspect has blocked you. A list of some of her current friends is on their profile page. Click the "See All" link at the top of the list. A search field appears at the top of the page, which you can use to type the person's name. If the person's profile appears, you have not been blocked. If it doesn't appear, you may have been blocked. While few people have their friends listed publicly if you can find such a person, try logging out of Facebook and looking at their list of friends. If the person is visible there, but not when you were logged in, you have been blocked. FB Block in Wall Posts If you can remember any posts the person has placed on your profile, business page or a mutual friend's page in the past, finding those posts now can indicate whether you've been blocked. If you have been blocked, the wall posts will still be visible, however, his profile picture will be replaced with a question mark. Additionally, the person's name will be in black text and will no longer be a clickable link to his profile page. If no one has, the person may have terminated her account or may have been suspended from Facebook. 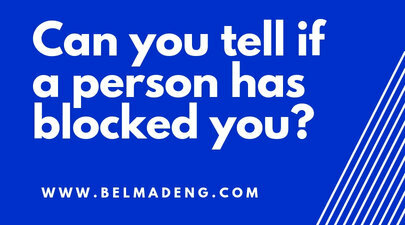 Lastly, you can ask your friends, or the person directly, whether you have been blocked.